Cut the crusts off of the sandwich bread. Brush a slice with grainy mustard then layer on a slice of Gouda cheese and two slices of mortadella. Cover with a slice of bread and again layer with mustard, Gouda, and mortadella. Complete with another slice of bread on top. Repeat until you have three sandwiches. Heat an oiled grill pan over medium-high heat. Grill each sandwich on both sides until golden brown. Cut each sandwich into four triangles and halve each rosemary sprig width-wise. 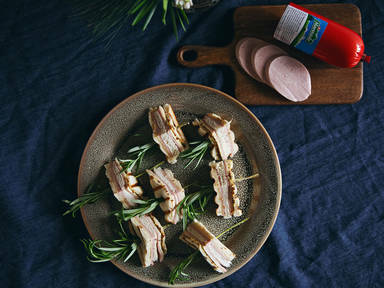 Skewer each sandwich triangle on one rosemary sprig. Enjoy as an appetizer!